All of what we have with ‘Mungo Jerry Magic’ really began as traditional Mungo Jerry Fan Clubs that were in existence from 1970 up to around 2003. The fan club as it was, was replaced by the Mungomania website which began in 2003 when it was decided to replace all the newsletters, fanzines with…a website…the reason being, it was much cheaper, a lot less work, etc. Mungomania became Mungo Jerry Magic in 2017 but we thought that it would be fun to have a run down on the various clubs and the products made available to fans over the years. 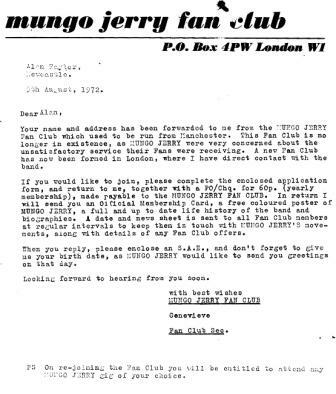 The mind goes a bit as you get older, so my memories of fan club membership around 1970-71 is a bit hazy. 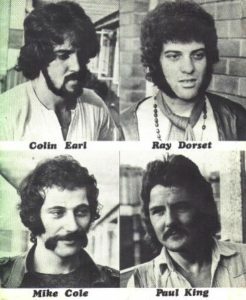 I do remember that I received some sort of membership card, a poster of the band and the a fan club booklet (see right), that contained a printed autograph page, a brief history of the band as it was then and individual pieces of each of the band – Ray Dorset, Colin Earl, Paul King and Mike Cole. 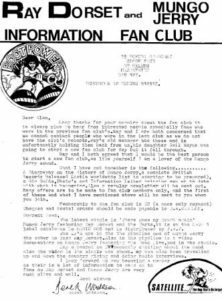 Whether there was disappointment or not when the Manchester based fan club closed, I was overjoyed to receive a letter asking me if I would like to join the brand new fan club, now based in London, with Ray very much involved with everything. Regular newsletters made every postal delivery an exciting time and even though things were pretty basic back then, with individually typed sheets often the norm. Gig lists meant that you would never miss the band if they were up your way and in those days, they were everywhere believe me. We even had the regular special offers and I heard for the first time, the expression – ‘fan club only’ – when we were informed of special offers of t-shirts, posters, badges, and even for the first time, a ‘fan club only cassette! Gail Wayne, daughter of Ray’s then manager, Cyril Wayne was next in line to give it a go but it never really got off the ground unfortunately and as far as I know, only one letter was sent out to fans, asking us to go out and buy the latest double-A sided single, Knocking On Heavens Door/Hazel Eyes, before things were wound up. Long-time fan, Derek Wadeson had at that point already approched Ray with a view to running the fan club but Ray was committed having already said that Gail could do it. After thinking that it was the end for the Mungo Jerry Fan Club, it was extremely heartening to hear that a guy called Derek Wadeson who was based in St.Helens on Merseyside had set things up again. Derek explained in the Mungo Jerry book, Beyond The Summertime. “It was while Ray was doing a tour of radio stations to promote Knocking On Heaven’s Door that I first spoke to him about resurrecting the club. “At that time, his then manager Cyril Wayne wanted his daughter Gail to have a go, so the idea was put on ice until Gail’s venture folded and Ray was ready to release There Goes My Heart Again. “By this time I had known Ray for several years, attending more gigs and collecting more records than my bank balance dares to remember. “So with Ray’s blessing, I set about starting up the Mungo Jerry Fan Club Mk4. It was initially made much harder due to Cyril having lost all the old fans addresses, so I had to start from scratch. “I first set about calling it the Mungo Jerry Information Fan Club, but quickly dropped the ‘information’ from the title when people started writing to me giving me addresses that they suggested I write to if I wanted info on the group! “My main aim over the years was to keep fans up to date with Ray’s/Mungo’s happenings, and to try and supply as many old records to help keep their collections complete, a task that has become harder over the years. “Ray helped the cause no end by making available through the club some of his unreleased material on cassette”. Sadly, it couldn’t go on for ever and after starting up his own business in the early 90’s and finding that time was against him, Derek asked me to take over from him. The first thing to do after taking over from Derek was to put my first fanzine together, and I duly came up with issue 5 which was a fairly basic fanzine now called Mun-go For It! The fanzines contained all of things, and more, that used to go into the newsletters and between Derek (who remained heavily involved) and myself, we came up with eighteen in total. I actually worked on and produced issue 19, but the decision had been taken to discontinue the fanzines, mainly down to costs, and concentrate on the new fan club website so issue 19 was never sent out to fans. Mungomania, the name of the new website, and inspired by the Melody Maker headline in 1970 – IT’S MUNGOMANIA started in 2003 and there were several versions before ‘mania’ closed down. Mungo Jerry Magic, came from an idea of Derek Wadeson’s and with Alan Taylor’s help, we now had the two previous fan club secretaries working together on this new website. Hopefully, ‘magic’ will give fans all of the things that the old fan club did and keep fans everywhere, up-to-date with all things Mungo. There were nineteen fanzines in total, although the last of these wasn’t sent out to fans. The decision had been taken to stop producing them due to the cost involved. Work had started on a website called Mungomania to replace all of the various newsletters, fanzines, etc – much cheaper, cleaner and easier!